Housing conditions can impact physical and mental health. In 2013, Portugal was still the fourth European Union country with the highest percentage of population without an adequately heated home in winter. Other adverse conditions are, for instance, overcrowding and living in older buildings. Some studies stress the relationship between stroke and poor living conditions in the elderly population, especially cold homes. Univariate and multivariate spatial cluster analysis were used to explore the relationship between excess stroke death risk, from 1998 to 2004, measured by the standardized mortality ratio (SMR) for several cohorts (including persons over 64 years old), and poor housing variables from the 2001 census, at the parish level in continental Portugal. A multivariate cluster of parishes, with population without any form of heating their homes as dominant condition, was detected in northwest Portugal. Mean and median SMR values across all cohorts were consistently higher within this cluster. 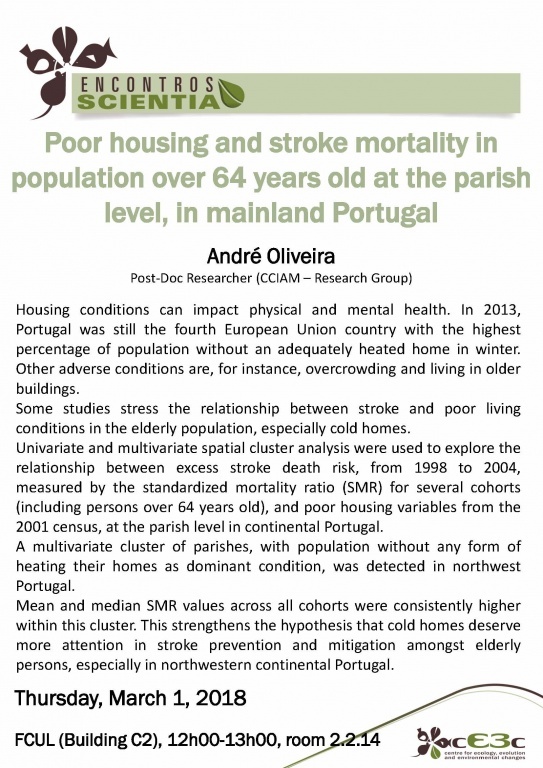 This strengthens the hypothesis that cold homes deserve more attention in stroke prevention and mitigation amongst elderly persons, especially in northwestern continental Portugal.